Soar into Adventure with the all new Pride® Raptor! With speeds up to 14 mph and a 400 lb. weight capacity, it’s the perfect scooter for anyone and everyone. 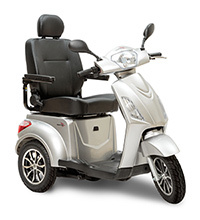 Travel greater distances with a per charge range up to 31 miles and experience a smoother ride over varied terrain with front and rear suspension.